Welcome or Selamat Datang to Day 2 of Around the World with Joe DiStefano! 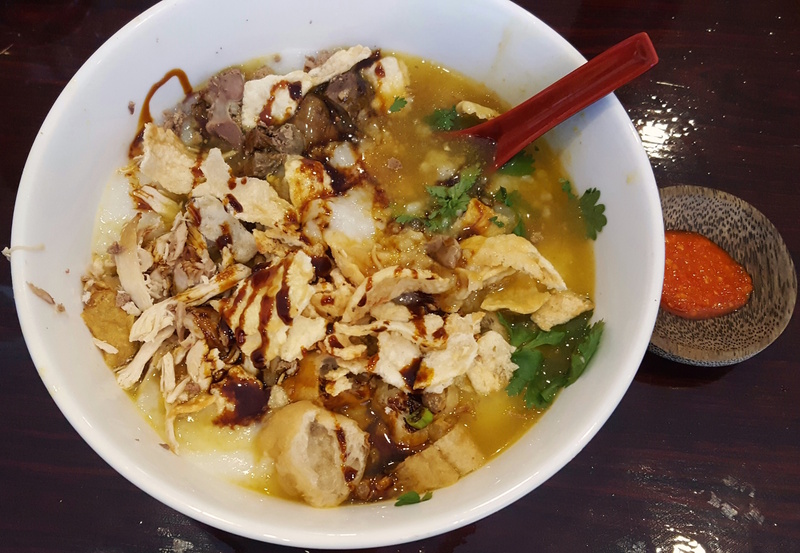 Want to know where to get the best Indonesian food in the NYC area? Looking for a new spot to go on a Lex? Read on for Joe’s recommendation! I’m a big fan of Indonesian fried chicken, so when I spied ayam goreng kalasan, a variety marinated with coconut water, I had to try it. It was some mighty fine bird and came with a sidecar of sambal terasi, a fiery red pepper concoction made with terasi, or fermented shrimp paste. It’s one of several sambals that the Jakartan chef-owner Siliwang “Awang” Nln makes in house. One of the first dishes I tried was gulai otak sapi or curry cow’s brain. 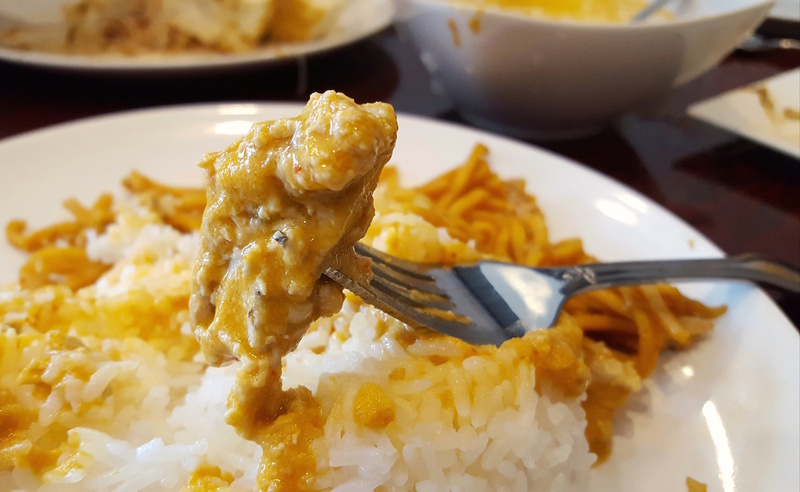 Served with rice and noodles, it’s some of the creamiest and spiciest cerebellum to be had in Queens. My dining companion and I were both impressed by the bright top note of kaffir lime and rich coconut base. The same winning flavors make an appearance in Awang’s tongseng kambing, or curry young goat. I’m no fan of tempeh, the funky fermented soybean blocks, but Awang makes a version that I find hard not to order every time I visit. Tempeh mendoan transforms the otherwise odious soybean patties and turns them into scrumptious fritters. 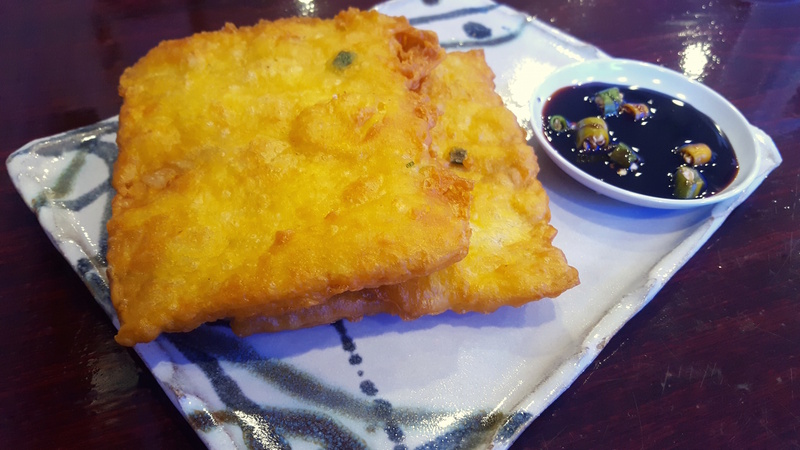 Crisp on the outside and creamy on the inside with just a hint of fermented tang, they’re great dipped in the accompanying sweet soy sauce called kecap manis. Kick it up with a bit of green chili. 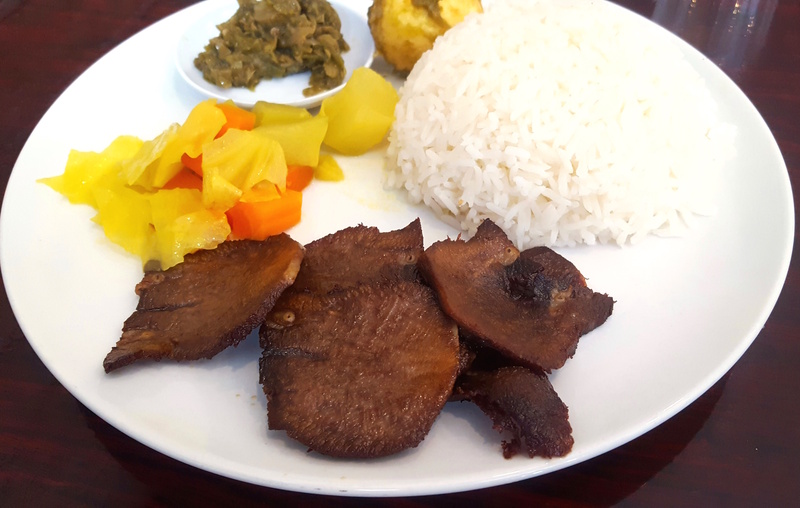 In addition to that curry brain, there’s plenty of other bovine offal, including curry beef tendon, and a lovely fried cow tongue known as lidah sapi goreng sambel ijo in Indonesian. Sambal ijo turns out to an incendiary paste made from roasted green chilies. It’s also featured in a fried duck dish that I have yet to try. Awang Kitchen has begun rolling out specials listed on a neon purple board. Among them is the most offal-enriched version of bubur ayam—chicken and rice porridge—I’ve ever tried. Liver, kidneys, and heart can all be found in the bowl in addition to white meat and shards of crunchy cruller. It takes well to kecap manis and sambal terasi and makes for a hearty, soul-warming lunch. Last night I tried something called bakso kabut from the specials board. 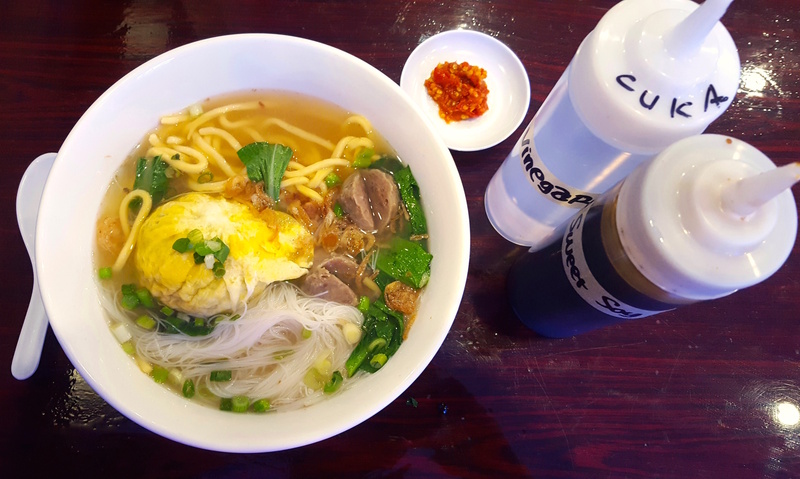 I’m familiar with bakso as an Indonesian meatball soup and to be sure the beef broth featured squidgy liitle meatballs that resembled beefy Pacmen. But the star of the show was the bakso kabut or “foggy meatball.” The handball-sized orb was coated in a fried egg. Two kinds of noodles rounded out the bowl which came with vinegar, kecap manis, and, of course fiery sambal bakso. The fog lifted from my brain and sinuses about halfway through. Awang told me he plans to add bakso beranak—a meatball soup featuring a giant orb stuffed with a smaller meatball containing a quail egg. The name refers to pregnancy. 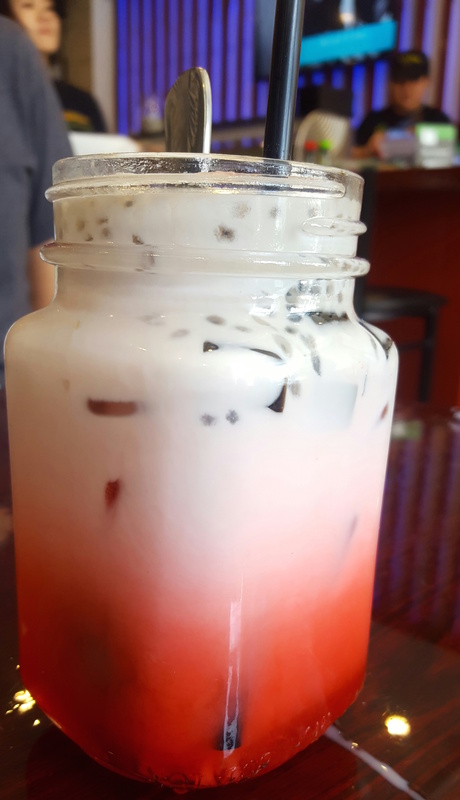 For dessert there’s avocado shakes and sometimes a special of es cincau kelapa, a psychedlic pink mug of grass jelly coconut and other goodies that will cool any residual chili heat while giving you a sugar rush. Did I forget to mention that Awang Kitchen also has a rather incongruous sushi bar? When I told Awang that it would be good idea to feature one of his homemade sambals in a spicy roll, Awang seemed puzzled. Want to learn how to order authentically spicy Indonesian food in Indonesian? Check out another Chopsticks and Marrow article we love here.